It’s been dull and grey for a week or two here; just as well that I’ve been doing a fair bit of work on the computer. While spending more time online than usual , I’ve been discovering an unusual phenomenon regarding the ever-growing and ever-changing culture surrounding wine. For a start, Wine Folly, which is like a wine guide for dummies, is a new generation wine geek site, integrating technologies and entertainment into wine education, using visual effects, videos, Facebook and Twitter. Now you are beginning to see more and more wine blogs reaching out to wine drinkers across the globe through social media. It is quite revolutionary, but on the other hand, I couldn’t help but to question this new trend, so called “Digital Wine Communication”. What is funny though, is that the blog, Miss Vicky Wine, that was passed on to me by a French friend of mine a long ago is one example of the trend. And EWBC, which hold conferences around the world and whose last event was held in Turkey but I missed, and Wine Conversation are major driving forces behind the trend. What are their goals? To promote the sales of wine? The more they drink the higher the price will be; the rule of free market. However, I’m noticing one common concept among these sites, which is promoting more value-for-money wines and regional wines, and I like that. Hang on, then, what I’ve been trying to do is not far off from this. I’ve been holding food and wine evenings to share different wines that won’t cross paths with me otherwise. Especially, the last event was a good example. How on earth would I have come across Lemberger wines from Germany if it hadn’t been for my blog? They wouldn’t have brought that wine if they hadn’t checked my blog beforehand for sure. They detected my passion for food and discovering new wines. German wines, considering the geography, can be assumed to have more characteristics of cold climate grapes such as Pinot Noir, which is easy to match with food. What I’ve been realising recently is how these smoked things enrich the world of gastronomy. Why do we love smoky flavour so much? Sorry if you’re not one of them. Bacon, smoked bacon, smoked fish, smoked salmon, smoked cheese, smoked eggplant and capsicum, and smokey wine!Yes, smoking cigarettes. They are not only delicious to eat, but also an economical way to elevate the flavours of a dish just like saffron would. Because of its powerful flavour, you don’t need a lot of it in cooking. So I use a bit of bacon or chorizo, only if available like these days, in some dishes that can be too bland otherwise. Do you use the same trick? One lazy evening I made a quick pasta dish with mushrooms in a real Italian style, Pasta alla Carbonara. My carbonara doesn’t include cream, not even butter, but it’s still creamy and delicious. It only requires eggs and cheese! Though my version consists of milk, egg yolk, parmesan. (I prefer my version because it’s more moist and more creamy rather than eggy). It takes only 10 minutes to cook. I have a queasy feeling about the westernised creamy pasta only served outside Italy, commonly known as Afredo sauce, which uses cream. Grrr…no thanks for me. Especially, the pasta submerged in a pool of cream is just wrong and I see it as an utterly lazy way to cook and it’s an insult to the Italian cuisine. I have no problems with creamy sauce, but pouring a whole packet of cream instead of making it with butter and cheese is just not my style. How many people keep cream in the fridge all the time anyway? Probably, 1 in 100? Anyway, you can skip to the Carbonara Tutorial by a real Italian. Though it’s unusual for me to eat pasta twice in just three days, it just happened on those days when I didn’t feel like eating a cold sandwich for lunch. I quickly scanned inside the fridge and saw the packet of smoked fish Mr.O brought from Ireland; it’s not cheese so I can’t keep it forever unfortunately. 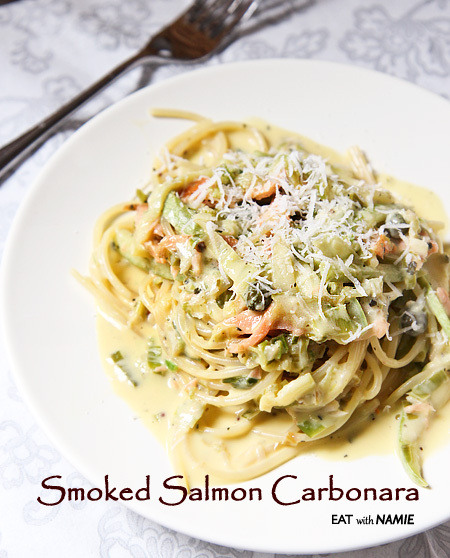 So I finally opened it and whipped up Spaghetti alla carbonara with Smoked Salmon. Wow, heavenly! When was the last time I had smoked salmon? It must have been over a year ago. It’s such a great dish. Thank you, Italian coal miners! Eating pasta alla carbonara always conjures up the memory of my eating the very first home-cooked carbonara made with lovely prosciutto, which was served with black olive rocket salad. My culinary knowledge was very limited back then and it just blew my mind. I’d been cheated by fake carbonara all that time! Since then, I’ve been feeling compelled to correct the misconception of creamy pasta in places where creamy pasta seems to be misrepresented. 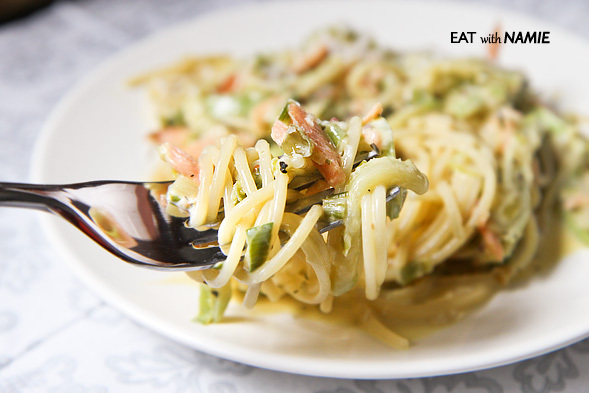 So if you’ve been misled by wrong carbonara, try this real Italian style carbonara. However, if you already know the authentic version and still prefer the cream version, then you don’t have to. When the food is good, I can’t resist wine, so even though it was lunchtime, I poured myself a glass of Lemberger that was still left from the night before. 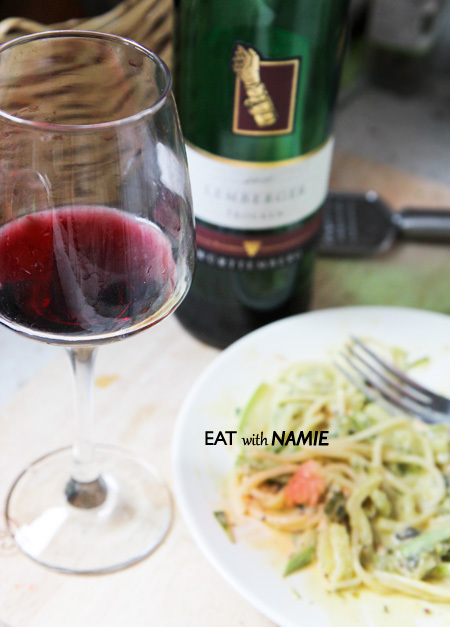 Luckily, the wine, which was light, fresh and cherry-fruity with noticeable bouquet and mineral aromas and subtle spiciness, paired beautifully with my smoky creamy pasta. The Lemberger Trocken 2011 is from Württemberg. Lemberger, also known as ‘Blue Franc’, is said to have been popular with Napoleon and its production is on the rise in some parts of the world where easy-to-drink food friendly wines are in fashion. Though the original carbonara is only made with 2 eggs and cheese, I lightened it a bit by using one less egg and adding milk instead. I added a bit of zucchini to cut down the carbs and it was the only vegetable in the fridge, but you can add broccoli, peas, anything green or let the smoky salmon dominate. Remember it’s just a quick lunch and I’m a frugal cook. You can get extravagant if you’re privileged to have access to plenty of smoked salmon, but here I don’t have the luxury. 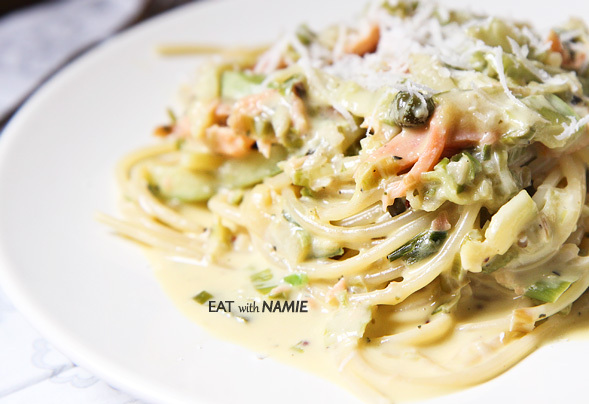 You can also make endless variations, using mushrooms and bacon, spinach and salmon, chicken, prawns, and so on. Don’t panic when you want creamy pasta and don’t have cream! 1. Start with boiling a pot of salted water to cook pasta, as the sauce is made instantly with pasta. 2. In a bowl, mix the egg, milk and cheese, and set it aside. 3. 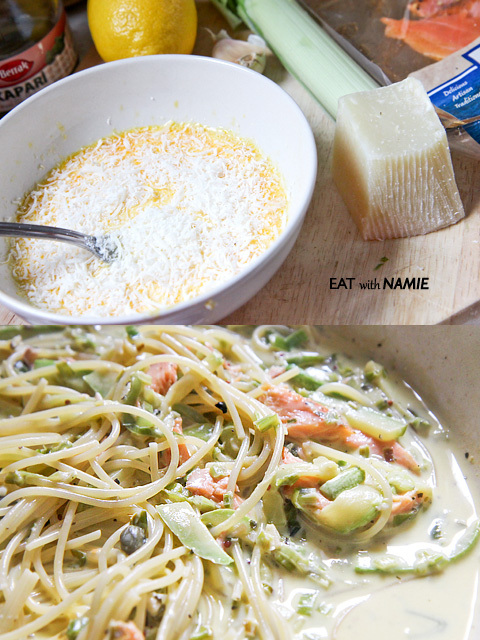 In a fry pan, saute the leek, capers and zucchini, if using, till softened, and add salmon and gently sir around. The past should be ready by now and ready for the real quick action! 4. Drain the pasta (a little liquid left is good) quickly, and throw it into the pan and turn off the heat. Quickly pour in the egg mixture and toss well. The heat from the pan and the past will cook the egg. 5. When the sauce thickens to the creamy consistency, serve immediately.